Last week I selected DSPBR Tax Saver Fund as the best tax saving fund for 2017 along with the process as to as to why I think the fund has the potential to outperform other ELSS tax saving funds in 2017. Readers wanted me to come up with the best midcap and the best large cap funds. 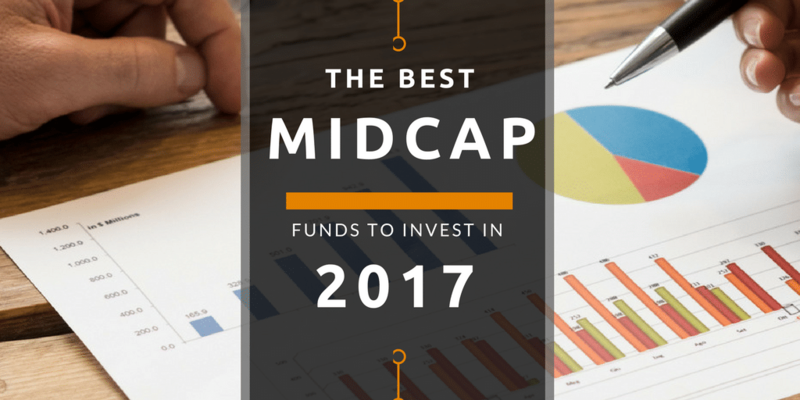 I chose to write about the best midcap fund of 2017 first because money is in the midcaps and I always prefer investing in a midcap fund over a large cap fund. I prefer midcap fund because when you are investing in a large-cap fund, you prefer not to loose but when investing in a midcap fund you prefer to gain. My investment philosophy is to gain and make profits with educated risks. If you have been following my portfolio, you will notice that I started with large cap stocks like Tata Steel, L&T and Infy and it was because market was down and there were opportunities but I was investing openly and wanted to make sure I avoided losses. Slowly moved over from large cap companies like Tata Steel, L&T, Infosys to midcaps like Pidilite and Britannia Industries. So will definitely share my best large cap fund soon but let me first select the best midcap fund of 2017. We select equity midcap direct funds that are rated as 3,4 and 5 star on ValueResearchOnline and has given more than 25% return in last 1 year. The process to select ELSS fund was different where we only chose 4 and 5 star rated funds but here we also added 3-star funds because there are few 3-star rated mid-cap funds that have performed really well in the past 1 year. The process is not rigid of only checking 4 and 5 star rated funds and we remain flexible when selecting. Also note we are using direct funds instead of regular funds and it is because when we prefer investing for very long term, we can save on the additional expense ratio of 1%. Check Direct Vs Regular Funds. With ELSS I selected regular funds because I don’t invest for very long term and only for 3 years which is the locking period to save tax. We have 10 funds as top midcap funds to invest in 2017 and so let us select the best midcap fund among them. Benchmark is always the first criteria to weed out any fund that is not benchmarked against our preference. Some value, opportunities and bluechip funds may be categorized as midcap fund but are benchmarked with BSE Sensex or BSE Sensex 200. So we only select the funds that are benchmarked against midcap index of Nifty or Sensex. From ValueResearchOnline data we build a matrix of asset allocation towards capitalization for each of the fund. 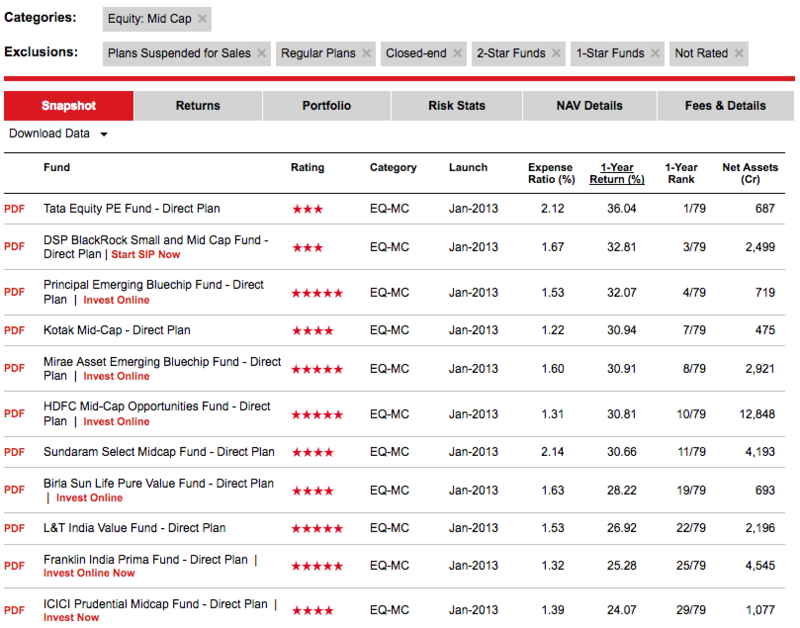 Principal Emerging Bluechip Fund has very low exposure to midcaps and has high exposure of more than 40% to large cap and so not necessarily a midcap fund though is benchmarked with Nifty Free Float Midcap 100. The best performing fund is DSPBR small and midcap fund and it is because it has more exposure towards small cap companies. It means they have done their due research in much more detail to invest in those companies and so fund is performing exceptionally well but it also means you are exposed to lot more small cap companies. Sundaram Select Midcap Fund has most exposure to midcap companies and may be a better midcap fund with no exposure to giant cap stocks in its portfolio. The only issues I see is the expense ratio of this fund, it is quite high. Has right blend of low exposure to giant cap, and large caps, good exposure of more than 50% to midcap and some small cap to boost the performance with low expense ratio. The only negative is it manages under 500 Crore of net assets. Both the funds have low expense ratio, manages thousands of crores of net assets, has the right blend of exposure to the giant cap, large cap, mid cap and small cap stocks. Both the funds can be the right choice of midcap fund to invest in 2017. This is not an endorsement that you should invest only in the above funds but the emphasis is on the process that I followed to choose the best funds and why only the performance of the fund should not be a factor to select a mutual fund. We select the fund based on what kind of exposure we need and how it can get us the right kind of exposure and diversification to our investments. If we want less exposure to small caps, we can select a small cap fund instead of choosing a midcap fund that has lot more exposure to small caps.